White Wolf : Dog And Wild Dolphin Meet And They Become Instant Buddies! 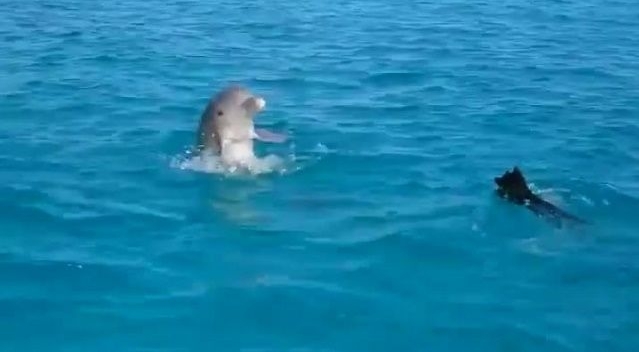 Dog And Wild Dolphin Meet And They Become Instant Buddies! Have you ever dreamed of swimming with the dolphins? The dog in the video just experienced that! This lucky dog in Greece dove into the water and there he met a dolphin! They become instant buddies and seconds later, they’re playing and swimming together! Greece has 1,400 islands, though only 230 of them are inhabited. And while everyone knows about Santorini and Mykonos, there are gorgeous lesser-known islands in Greece, too. Dolphins are highly intelligent marine mammals and are part of the family of toothed whales that includes orcas and pilot whales. They are found worldwide, mostly in shallow seas of the continental shelves, and are carnivores, mostly eating fish and squid. Dolphin coloration varies, but they are generally gray in color with darker backs than the rest of their bodies. Dolphins are well known for their agility and playful behavior, making them a favorite of wildlife watchers. Many species will leap out of the water, spy-hop (rise vertically out of the water to view their surroundings) and follow ships, often synchronizing their movements with one another. Scientists believe that dolphins conserve energy by swimming alongside ships, a practice known as bow-riding. Dolphins live in social groups of five to several hundred. They use echolocation to find prey and often hunt together by surrounding a school of fish, trapping them and taking turns swimming through the school and catching fish. Dolphins will also follow seabirds, other whales and fishing boats to feed opportunistically on the fish they scare up or discard. Responses to "Dog And Wild Dolphin Meet And They Become Instant Buddies!"